AmeriPride Services, one of the largest textile rental and supply companies in North America, is one of those companies looking at ways to be more environmentally friendly. The company selected the Topeka branch located at 400 SE 1st Street to participate in an alternative fuel pilot program. Over the past year, Topeka’s AmeriPride facility has purchased five ROUSH CleanTech Ford F-59 delivery trucks that run solely on propane autogas (the term used for propane fuel used in on-road vehicles) and installed a private propane autogas station with a 1,000-gallon tank to service these vehicles. Propane autogas has several benefits for the environment, but mostly it reduces the amount of carbon dioxide emissions and costs about 50 percent less than gasoline. 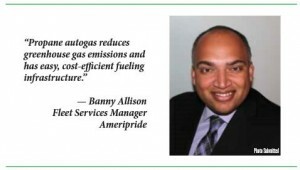 According to Banny Allison, AmeriPride’s Fleet Services Manager, the company has been looking at several ways to reduce its fuel consumption and greenhouse gas emissions since 2012. “We came up with a few different alternative fuels that would work for our business model, including compressed natural gas, propane, plug-in electric vehicles and hybrids,” Allison said. The various alternative fuels work best in different environments. Gary Newberry, general manager of AmeriPride’s Topeka branch, said Topeka was a great fit for the propane autogas pilot program because of its rural routes. “Due to our widespread territory with many rural routes, this was a good pilot test market, and I knew my service manager and chief engineer were solid guys that would find a way to make it work despite any challenges that might arise,” Newberry said. The Topeka facility experienced several challenges during implementation. One of those was an especially cold winter that created high price hikes for propane. At one point the company had to park the propane vehicles because it simply was too expensive to run them. With every new program comes learning and growth, but eventually the continued from propane pilot program proved to be successful. “Propane autogas reduces greenhouse gas emissions and has easy, cost-efficient fueling infrastructure,” Allison said. “Because of our success in Kansas, we are implementing the same autogas vehicles in the Sacramento and Fresno areas.” Newberry said he is happy that Topeka could have the opportunity to participate in this alternative fuel pilot program. Ben Saukko, spokesman for AmeriPride, said the company is committed to clean operations. “We strive to be better stewards of the environment and sustainability leaders in our industry,” he said. Kathy Webber is a mother of three beautiful children and has been married for 20 years. Her oldest child is K State this Fall! Kathy not only is a freelance writer, but she has been a Fitness Instructor for 19 years. She currently teaches at Genesis Health Clubs here in Topeka. In addition to helping others get fit, Kathy helps her husband out at his office as their Book Keeper. She really enjoys writing for TK Magazine because it allows her to be involved in the Topeka Community and exposes her to different businesses and people. May 31 Forgive. Fail. Fly.